Hill’s Ideal Balance Adult No Grain Cat Food is a complete food for adult cats aged 1 to 6. 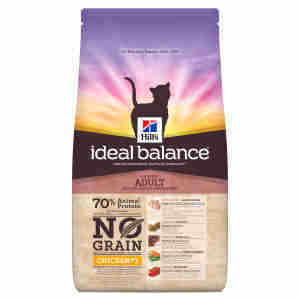 Hill’s Ideal Balance Adult No Grain Cat Food has everything your cat needs to live a happy and healthy life. Chicken meal (28%), potato starch, dried potato (15%), animal fat, yellow peas (5%), pea protein, dried peas (5%), vegetable oil, digest, minerals, fish oil, flaxseed (1%), dried beet pulp, dried carrots (0.5%), dried tomato pomace (0.2%), spinach powder, dried grape pomace, dried citrus pulp. Vitamin A 27,578IU, Vitamin D3 1,451IU, E1 (Iron) 199mg, 3b202 (Iodine) 3.0mg, E4 (Copper) 25.2mg, E5 (Manganese) 8.7mg, 3b603 (Zinc) 169mg, E8 (Selenium) 0.4mg; with natural antioxidant. (4.9%), vegetable oil, fish oil, dried beet pulp, minerals, flaxseed (1%), dried carrots (0.5%), dried tomato pomace (0.2%), spinach powder, dried grape pomace, dried citrus pulp. ash 5.7%, Omega-3 fatty acids 1.2%, Omega-6 fatty acids 3.7%, Calcium 0.84%, Phosphorus 0.73%, Sodium 0.38%, Potassium 0.71%, Magnesium 0.08%; per kg: Vitamin E 850mg, Vitamin C 140mg, Beta-carotene 1.5mg. Vitamin A 26,920IU, Vitamin D3 1,417IU, E1 (Iron) 269mg, 3b202 (Iodine) 7.1mg, E4 (Copper) 34.1mg, E5 (Manganese) 12mg, 3b603 (Zinc) 171mg; with natural antioxidant.